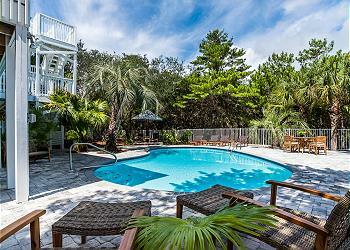 LOCATION: This home is located within walking distance to the beach. DETAILS: "Latitude Adjustment" is a freshly renovated three story home nestled in the quaint and quiet community of Blue Mountain Beach. 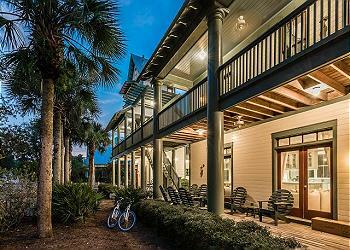 This fabulous abode features four bedrooms, three and half bathrooms and superb accommodations for up to ten guests. Guests will especially enjoy the beautiful gulf views. 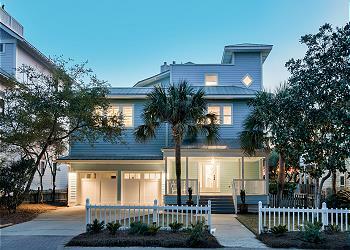 This home's convenient location offers a short walk to the dazzling, emerald waters of the Gulf of Mexico. Relax on the balcony or head down to the beach at the end of the day to watch the gorgeous Florida sunsets. When you aren't playing at the beach, explore the surrounding area on the bikes provided. 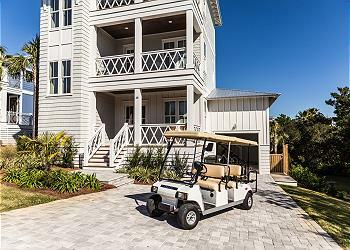 AMENITIES INCLUDE: 4 adult bikes provided, community pool, gulf views. This property comes with 5 dedicated parking spots. Complete Clean Linen Participant - ALL linens, including comforters laundered upon every checkout. What a peaceful happy place! I had a broken collarbone and thought sun and saltwater would be healing and lots of my family came to stay at different times during the week. Gorgeous water the first two days then Tropical Cindy forced us to stay inside and read, play board games around the big dining table, and spend quality time in this comfortable spot. We shopped and ate locally at Gulf Place though the kitchen is extremely well equipped. Love the location - quiet but convenient. We had one tv remote that went out and 360 Blue responded immediately. Love the App! I would definitely return here. This is such a great photo! You truly captured the beautiful green waters of our beaches. We are so glad to hear that Tropical Cyclone Cindy did not stop you from enjoying your time with us, and that you could take advantage of being so close to Gulf Place! Thank you so much for choosing 360 Blue and for taking a moment to share your experience with us. We hope to see you guys back at the beach soon! Loved this house and location! Would definitely come back! And 360 Blue is fantastic! Love this app!! Everyone at 360 Blue was tremendously friendly and helpful. Such a beautiful beach photo! We are so happy you enjoyed your stay in Blue Mountain so much! Thank you so much for staying with 360 Blue and we hope to have you back again soon! We had a wonderful week! There were a couple issues but 360Blue dealt with them quickly and checked on us. The house was beautiful and a great central location! Such a beautiful photo! We are so happy to hear that you enjoyed your stay with us! Thank you for choosing 360 Blue and we hope to have you back at the beach again soon. We had a wonderful stay at Lattitude Adjustment! The house is clean and well appointed. We were 4 moms and 6 daughters (16-18). 360 Blue was top notch! Always super nice, responsive and helpful. The wifi wasn't working and 360 Blue was fast and thorough fixing the issue. We will be back! Thank you! Our family of four had such an amazing time! This home is gorgeous...with perfect decor and beautiful touches! The floor plan is laid out incredibly well -- we could have easily fit several more families! The neighborhood was quiet and maintained well. The quick two minute walk to the beach via private boardwalk access made getting to the beach (and lugging all of our things) super simple! The beach itself was pristine and not very crowded. The 30A experience was amazing and one we will plan to do again!! 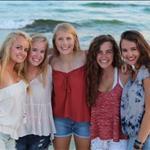 Hi Wade Family: We are so glad your enjoyed your 30A vacation! Thank you for sharing it with us! We hope you will stay with us again in the future! My husband and I are buying near your home! I just returned home after 4 lovely days spending time with my daughter and her friend! You have an amazing home and I simply loved your remodel! The location is great!! Thanks for opening your home up for others to enjoy!! What an awesome photo--thanks for sharing!! We are glad you enjoyed the vacation home and your experience with 360 Blue! This is the most beautiful property just steps from the beach. We were fortunate to stay in this newly renovated property. It was pristine! We stayed with our two elementary aged children and our friends with their two same aged children. The house is very spacious. There is so much room that we could retire to our separate areas when we wanted to. The kitchen is huge. I like it more than my own kitchen. And then there is the view! I could live on one of the three balconies overlooking the beautiful water. We saw dolphins two mornings from the balcony. I would highly recommend this property. I will be back!!! What a gorgeous sunset picture! That will make a nice background picture to remind you of your time at the beach! Thank you for choosing 360 Blue for your Spring Break vacation! We are so glad you enjoyed your experience with us and we look forward to hosting your family in the future!